The New Cover of The Golden Decade: Photography at the California School of Fine Arts 1945-55. 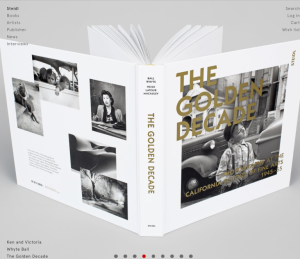 A completely new, redesigned, re-edited and revised version of the Golden Decade: Photography at the California School of Fine Arts 1945-55, published by renowned photography book publisher Steidl based in Gottingen, Germany, has been selling steadily in the United States for close to a year. The new Golden Decade has already sparked glowing reviews by many major newspapers and magazines, instigated book signings at some of America’s most prominent bookstore venues and catalyzed a handful of exhibitions at major museums, galleries and art centers. This year, Steidl, the book, or the photographers have been featured in USA Today, the New Yorker and many other prominent publications. Mainstay European newspaper, The Guardian, hailed the Golden Decade as the book about “the school that turned photography into art.” Beyond the Curtain, touted as Southern California’s premier art and society magazine, extolled the Golden Decade photography exhibition at the Laguna Art Museum as “not for the eye to miss” and “a special glimpse into California’s progressive cultural history.” The Beyond the Curtain review revealed the influential ties between Golden Decade photography and the world art scene, as well as the East Coast art establishment. The article in Beyond the Curtain showed how the West Coast, specifically the California School of Fine Arts, renamed the San Francisco Art Institute, between its painters and photographers, at the time became the world’s cutting edge expression of modernism. From obtaining funding through the Columbia Foundation, to securing facilities, the radio announcement, the first classes, launching the full-time program, abstract expressionism and much more, Latour’s essay informs, but does not overwhelm. Ansel Adams modeled the school on a rigorous piano conservatory approach to hands-on practice and set up the curriculum based on his famous Zone System. Early on a few students complained that the advertising promised courses by Ansel Adams just as he had become scarce at the school while working on his Guggenheim project photographing the national parks. The complaining faded when Ansel Adams hired Minor White, who in turn brought in prominent photographers to teach including Dorothea Lange, Imogen Cunningham, Lisette Model, Eliot Finkels, Frederick W. Quandt, Jr., Clyde Childress from the Art Center School, Robert McAllister, Homer Page, Rose Mandel and others. Beaumont and Nancy Newhall even gave a few lectures. The most anticipated student outings were to visit Edward Weston and Brett Weston at Wildcat Hill in Carmel, as well as photography field trips with Edward Weston out to Pt. Lobos State Reserve. Minor White taught his, at the time somewhat confusing, but later much lauded Space Analysis. Benjamin Chinn, Philip Hyde, C. Cameron Macauley and others who wrote or talked about Space Analysis each had different understandings of it, but in June of 1952, the American Annual of Photography published an article by Minor White that defined Space Analysis as simply “The Use of Space in Defining Pictures.” C. Cameron Macauley’s essay in the Golden Decade also has provides readers with an understandable summary. Space Analysis brought the photographer’s awareness to vacant space, filled space and the relationships between objects and space, with more emphasis on the space than the objects. Students applied Space Analysis both before exposure while looking at the ground glass and after the production of a finished print. Besides teaching portrait and landscape photography with large format cameras, White encouraged the study of motion by studying rush hour and doing street photography using “mini cameras,” that is, medium format and 35 mm. He also promoted the photographic interpretation of other arts including sculpture, plays, various other forms of performance and festivals. Students photographed the lively Fillmore District, the coast along Highway 1, industrial and architectural subjects with real world assignments by Pacific Gas and Electric Company, Stanford University, the City of Mendocino, the Gold Country, ghost towns and many other locations and clients all over Northern California. The essays by William Heick, C. Cameron Macauley, Ira H. Latour and others illuminate all aspects of student endeavor, both the day and night classes, student social gatherings, the striking philosophical differences between Minor White and Edward Weston and between Minor White and Ansel Adams. The latter at times brought on heated classroom discussions. Latour’s essay in particular offers an insightful, incisive dissecting not only of technical, creative and academic aspects of the photography program, but of the philosophy and character of both instructors and key innovative students. Separate essays, all rearranged for better flow in this new Steidl version of the Golden Decade, also cover student print exchanges, a student print-based fundraising event, the world-famous 1954 “Perceptions” show at the San Francisco Museum of Art and the founding of Aperture magazine with several students including Philip Hyde, Benjamin Chinn and William Heick, being featured in early issues. Another essay described the students hanging out and later mounting a show at Vesuvio’s Bistro in the bustle of San Francisco’s North Beach District, which soon after became the home neighborhood of the Beat Generation poets. “Vesuvio’s is usually crowded with painters, photographers, craftsmen and sighseers,” wrote C. Cameron Macauley. An essay by Pat Harris, “A Woman’s Perspective” explained that though most of the men had just come out of Word War II and were going to art school backed by the G.I. Bill, the primarily non-veteran women enrolled in the classes had to scrape and pay for school on their own. People kept saying to Pat Harris that science was not for women at each school she attended previously, but Ansel accepted her into the photography program and with mentoring from Imogen Cunningham she thrived. Ansel Adams spoke of photographs representing a spiritual experience. The Golden Decade nature photographs exemplify either subtle or more obvious post-war transcendence. The landscape photographs contain some kind of spiritual quality, either through the use of light, or the arrangement of the subjects. Symbolism, ironic juxtaposition and the careful handling of negative and positive space around objects is as important as the objects and people themselves. The influence of Minor White also shows in the patterns and psychological emphasis, sometimes on humor, sometimes on tragedy, but always giving added meaning to the images. Metaphysics often shows or is alluded to in the street and people photographs as well. Pirkle Jones, William Heick, Gerald Ratto, David Johnson and many of the others expressed their greatest artistry in their photographs of people. The first photograph in the student portfolios, “Nun and Child” by Ruth-Marion Baruch, like many others in the book, was clearly best expressed in black and white rather than in color. The nun’s habit with it’s black and stark white oversized collar contrasted with various grays and off-whites of the surrounding children all framed in a dark doorway. Baruch’s “Benicia” also juxtaposed innocence, optimism and the liveliness of youth in the foreground with the disappointment, unfairness and misfortune of life in the background. The images of Philip Hyde, Stan Zrnich and the other landscape photographers tended to speak of timelessness and at the same time remind us that we are here by either grace or accident and that this moment, this vivid now is fleeting. ‘Gather ye photographs while ye may.’ The Golden Decade shines on forever and glows golden for only one bright decade. It continues on and ended just yesterday: a book worth learning from and keeping safe for studying over and over; a time in history worth struggling to grasp and hold onto whether you are a historian, collector, photographer or artist in another medium.